This post is not to necessarily highlight a new concept, but rather to show off a relatively new display concept to add additional options to one of our current product lines. Our Discovery displays have been on the market for nearly seven years, however we have just recently added additional materials to use as an accent on the displays. 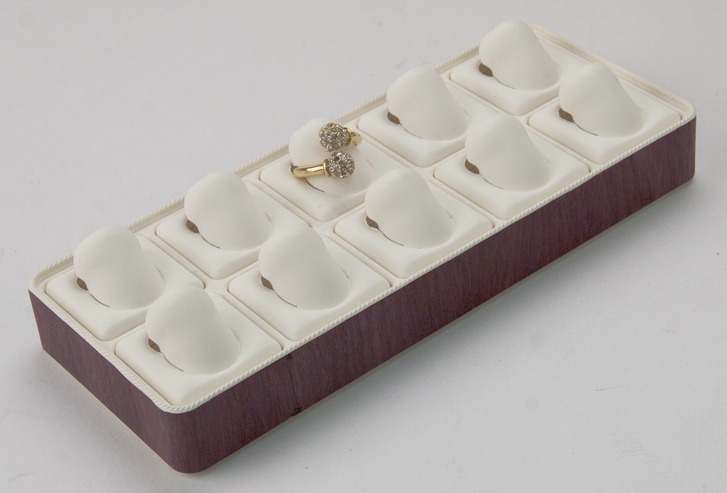 For those unaware of our Discovery, it a product line of stackable jewelry displays which utilizes our proprietary Oro-Lite material and can be accented with any fabric, vinyl, Reelwood, or veneer accent to heighten the presentation of your jewelry. Until recently our Discovery displays only had a limited amount of hardwoods which can be used to accent it. We now changed that with the addition of 24 new exotic hardwoods which can be produced in either a waxed finish or a non-waxed finish, this means a total 48 possible exotic wood choices. 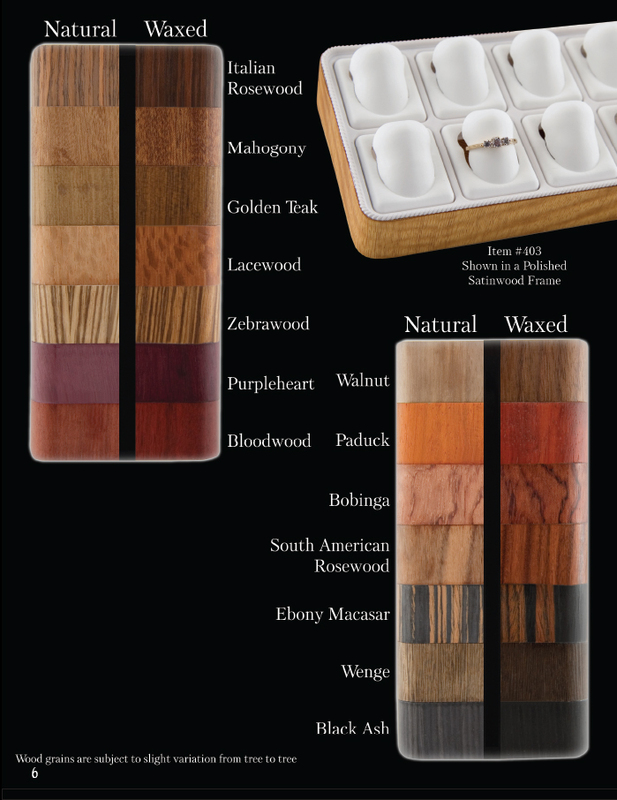 The color chart below can be found on our latest Catalog of Jewry Displays on CD, it shows off all 48 exotic hardwood options we offer. All of the woods you see here are genuine 100% exotic hardwood veneer of the finest quality, providing your displays with an elegant accent which can be used to better accentuate your jewelry. 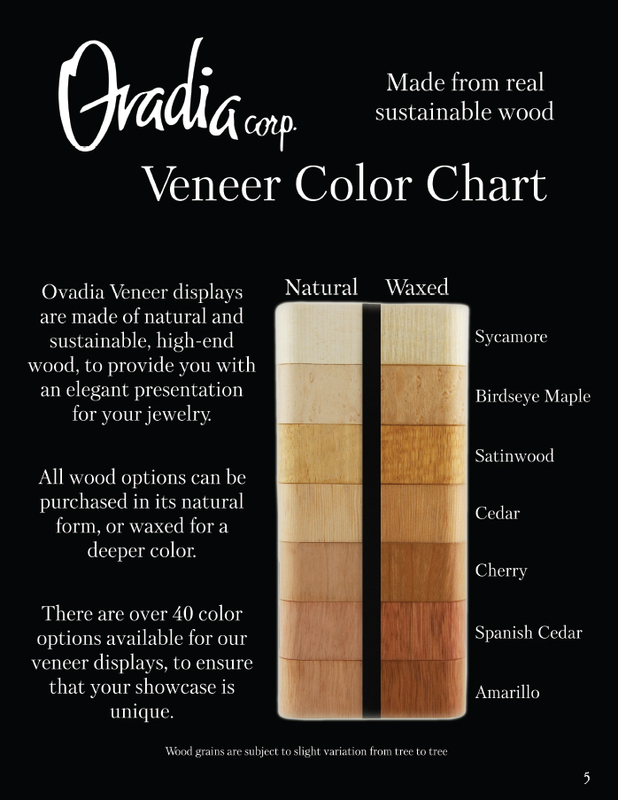 We do offer more veneer options than just what is shown on the color chart; any wood you desire to accent your jewelry displays can be potentially used without a problem, just call or email us if you are looking for specific species of wood to accent your jewelry displays. It should be made perfectly clear that everything shown on this color chart is genuine exotic wood, if you are currently using a faux wood as an accent on your displays then a genuine wood may not match what you are currently using. Additionally, each display made from exotic hardwood will have slight variations as no two trees are exactly alike. However if you are currently using genuine hardwood to display your jewelry, our Discovery line using these exotic hardwood veneers really can be the perfect complement to the displays you already have. Even if your current displays are a faux rosewood or something similar, you can see from our veneer color chart that we actually have two woods which are deep red in color when they are waxed, these being our Bloodwood and Paduck veneers. Faux woods displays often leave much to be desired in terms of jewelry presentation, so if you are interested in upgrading to the real thing Ovadia will be more than happy to provide you with that option. The varying colors and textures of the hardwoods allow for a multitude of possibilities for which to provide you with the perfect accent for elevating the presentation of your jewelry. This display's accent is made from genuine purpleheart wood. I’ll be adding some additonal posts this week on new display concepts we’ve been developing, so stay tuned. Some of those woods are very nice.